A little time away from the internet can do us some good once in a while. 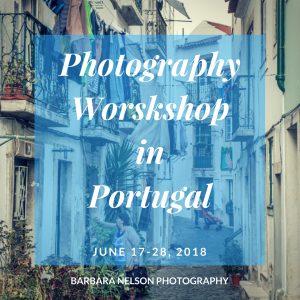 However, the reality is that many of us need and want to stay connected most of the time — especially when we travel. For me, it’s important to keep up with business and to stay in touch with family and friends sharing my experiences via social media, email, or Skype. As a travel blogger, it’s critical to stay connected to keep engaged with my audience. It can be a challenge finding the right connections when traveling internationally, especially since charges for global data coverage options offered by U.S. cell phone carriers can be astronomical. Over the past several months, the XCOM Global Mobile Hotspot has become my go-to wireless connectivity solution when traveling outside of the United States. Since my first experience with XCOM Global Mobile Hotspot (“Our French Connection” in Paris and Provence), I’ve had an XCOM hotspot device with me traversing country roads in Tuscany, exploring secluded areas of Quebec’s maritime region, and gazing upon history from the hilltops of Rome and Florence. The XCOM hotspot provides unlimited wireless data access for up to 10 devices (laptops, smartphones, and tablets) for use in over 175 countries. There are various plans depending upon your needs and what countries will be visited. 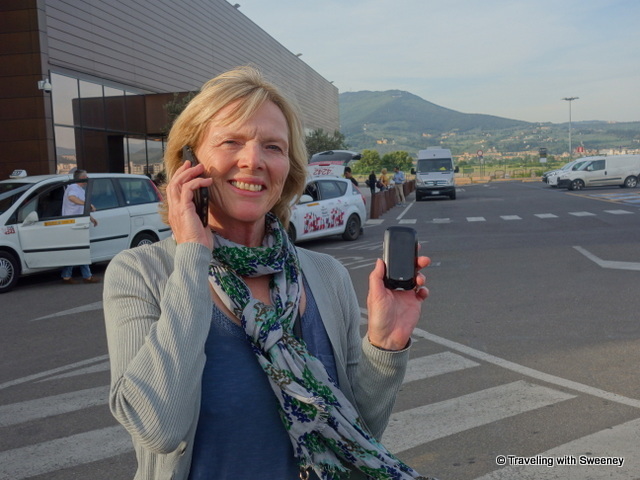 Upon landing in Florence, I activated the hotspot, connected quickly with my phone, and was able to make a call with Skype to our villa in Tuscany to let them know we’d arrived and would soon be on our way to check in. 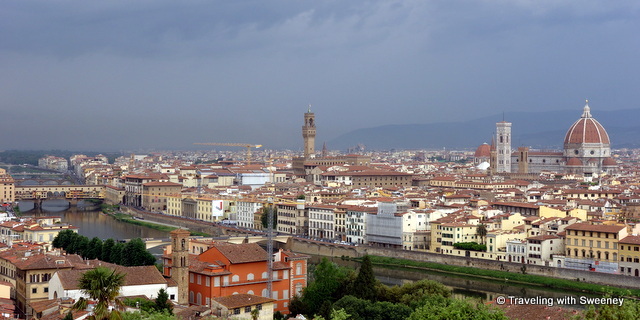 Arrived in Florence, Italy! Now contacting the villa managers to let them know I’m on my way! 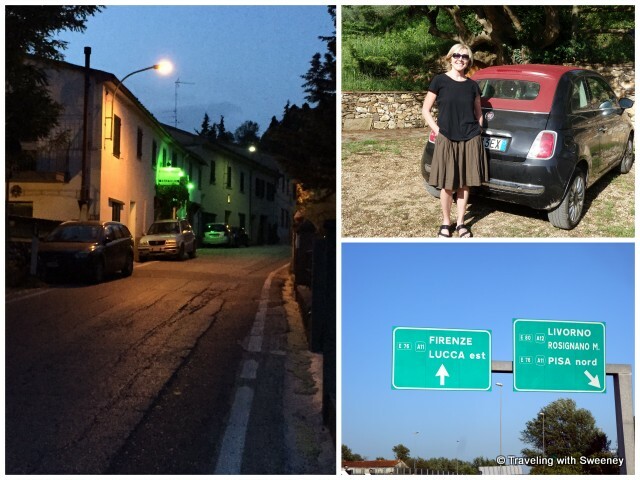 Staying connected while driving in unfamiliar places is very important and my husband and I took advantage of maps and apps many times as we explored Tuscany on the highways and country roads in our fun little Fiat 500. One night, we took the wrong exit off the main highway heading back to the villa from Florence. It was dark and there were very few signs on this winding country road through the Tuscan hills. Once we realized our mistake, we got online to see where we were and what to do. We decided to keep on our new route instead of going back and were very glad when we saw the lights of the small village of Lucardo which was near the villa. 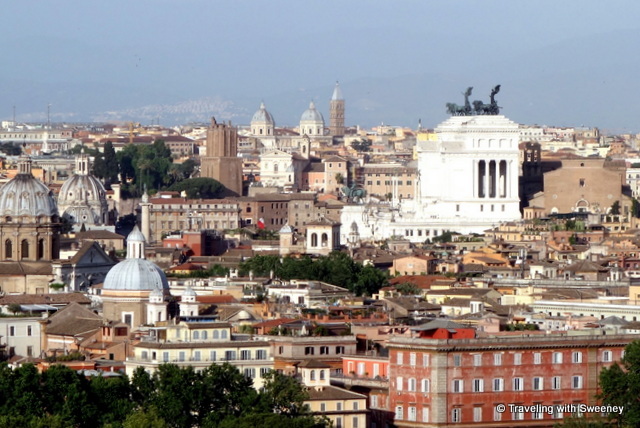 When in Rome, I was constantly seeing sites that I couldn’t wait to share with friends and my blog audience. The city is amazing. 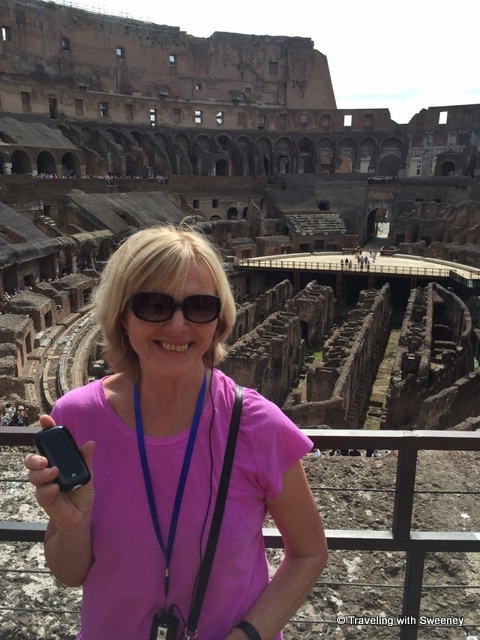 This photo of me at the Colosseum went directly to Twitter! We also were happy to have access to guides, maps and reviews for picking restaurants and finding attraction locations. Before leaving Rome for the United States, there was one final task on the plane before take off — ordering the taxi for pickup at Chicago’s O’Hare International Airport. Arrivederci, Roma! 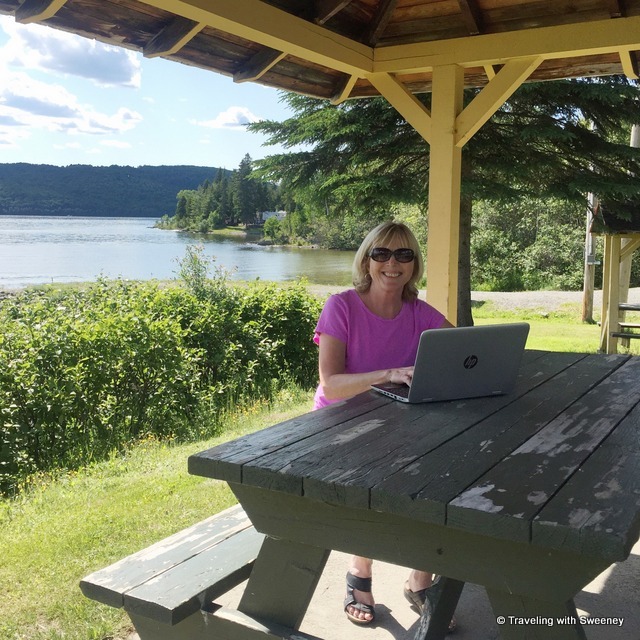 Before leaving for a press trip in Quebec, I wondered how good the coverage would be in areas of the maritime region far less traveled than the popular cities of the province. Would XCOM Global come through for me? The hotspot worked beautifully. There was an occasion when my Canadian travel companion wasn’t getting any signal from her own carrier and I was able to help her out since I had coverage. That might not always be the case, but it certainly worked out for me this time. My husband wasn’t on this trip, so a big benefit of reliable Wi-Fi was being able to make Skype calls to him each day no matter where I was. Size: The device is small, slim and light and can easily fit in any pocket, purse, or small case. I carried it (as well as an extra battery) in a zipped pocket of my purse. 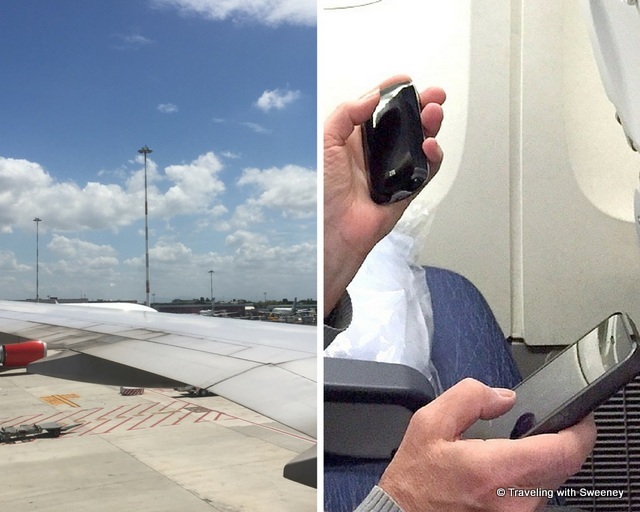 Multiple Devices: On the trips with my husband, we had four devices — two laptops, two smartphones — at least two in use most of the time and sometimes three or four. Ease of use: It’s quick and easy to get connected — install the battery, turn on the power, locate the device as an available Wi-Fi network on the smartphone, enter the password, and connect as you would to any network. Coverage: I experienced very good 3G coverage throughout each trip. The only times that I was temporarily without Wi-Fi were in very remote areas of Quebec where no carrier was providing services. Unlimited data: There’s no need to worry about going above usage limits as far as the hotspot is concerned. However, note that you are still subject to each carrier’s Fair Usage Policies if their networks get overloaded. Battery life: The battery lasts about four hours. As a blogger using social media frequently during a day of activities, I kept the device powered on most of the time, so having a backup battery was very important. I also found on one day in Quebec having a portable charger came in handy – not just for the Wi-Fi device, but for my smartphone, too. But generally, I simply charged the batteries each evening and was set to go the next day. Order and return process: The device and accessories arrive the day prior to the trip with a prepaid FedEx Ground envelope to return the hotspot when back in the United States. 24 hour support: It’s nice to know it’s there; however, I haven’t yet had the need to use it, so I can’t comment directly about XCOM’s technical support. Why not buy SIM cards in other countries? From my experiences, there are several advantages over using SIM cards which I’ve purchased on previous trips to Canada and European countries. However, there are several reasons that a mobile hotspot has proven to be a better option for me. 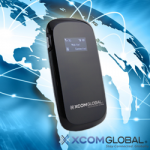 The XCOM Global Mobile Hotspot provides coverage beyond your smartphone as it works on laptops and tablets, too. Researching how and where to get a SIM card for a destination can be time-consuming and then getting to each purchase location requires time and logistics. It’s nice to avoid that headache when you’ve begun your holiday. Short-term data plans are not available everywhere for SIM cards. SIM card plans can be complex, possibly magnified with language barriers in the stores outside of your own country. Even when language is not an issue, I’ve usually found that the phone stores have waiting lines and the process of signing up can take a long time. Unlike the mobile hotspot, with SIM cards you have to recharge them as you use data since fees are based on specific data amounts; this can be costly and time-consuming. Why not use Wi-Fi at hotels, cafés and in other public places at your destination? Availability and Reliability: Rather than needing to look for free Wi-Fi hotspots in cafés, the XCOM Global Mobile Hotspot is always on hand. Although most hotels have Wi-Fi access, it’s sometimes very expensive and it’s not always reliable. The hotspot makes for a great backup in cases where you don’t have internet availability in your room or if the premium access is not affordable. Security: We also felt more secure with our own password-protected wireless network avoiding the risks of public networks. Coverage areas: Check the coverage areas on the XCOM Global website to see countries where their plans are available and the service areas of the local carriers. Rental plans: For my uses so far, I have only required a daily coverage plan for one country on each of my trips, but XCOM offers other plans, including those for covering multiple countries (even a special Europe Travel Plan option that covers 40 European countries) and a monthly package. Value: Consider how many (and what type) of devices you have, how long you’ll be gone, and where you’ll be traveling to determine the value for each of your trips. The more devices you have accessing the XCOM hotspot, the more economical it becomes. The XCOM hotspot may not be the lowest-cost option in some circumstances, but is definitely an affordable option for many travelers and the benefits are worth it. Avoiding the downsides of other options I mentioned and the peace of mind can be priceless. Will I consider XCOM Global’s Mobile Hotspot for my future international travels? Si! Oui! Yes! Disclosure: The XCOM Global Mobile Hotspot was provided to me for review by XCOM Global, but my opinions and perspectives are completely my own — as always.